Large hunting or homesteading parcel near the Current per Month with Down payment. 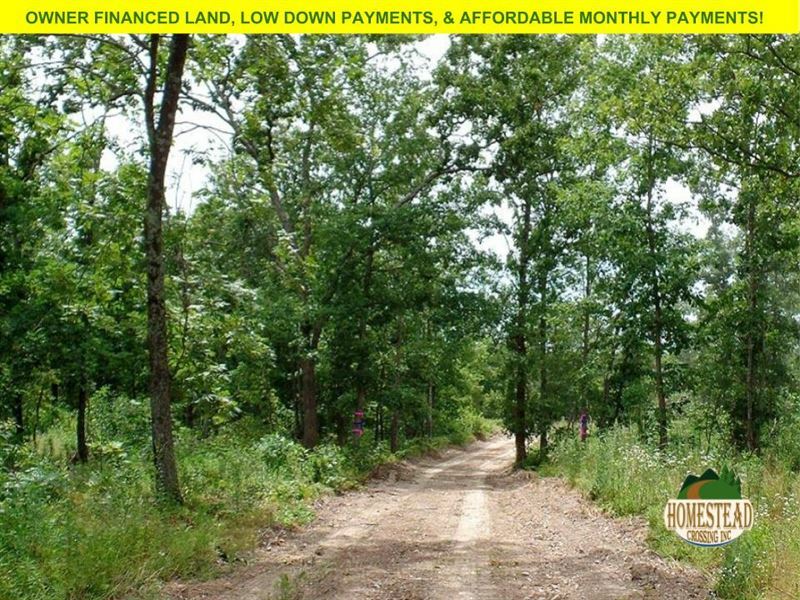 Total purchase price: parcel is absolutely stunning and has some amazing views and some of the best hunting in Southern Missouri. The parcel is located off of Highway K near Jadwin, Missouri which is in Dent County. The parcel has two very nice, mostly level clearings that have plenty of room for a nice cabin, home, barn, shop, etc. The terrain of this parcel is varied and is best described as mountainous. The land is mostly level on the East side and then slopes down towards County Road 650 exposing magnificent views to the North and West of the valley and hills below and beyond. There are also several nice trails that run throughout the parcel to allow access to the different sections of the land. Hunting in this area is plentiful, and several large species of wild game can be found year-round roaming the local mountains, trails, valleys, and waters of this area. County Road 650 which is just past the North-West corner of this property is less than three miles from the public access point for the legendary Current River which is part of the Ozark Scenic Riverway and has some of the best Trout fishing this side of the Mason Dixon Line. Also at the public access point are several campsites and equestrian riding trails along with several thousands of acres of Pioneer Forest. I don't know if I mentioned it or not but this area is absolutely beautiful. Electric service is available off of Country Road 650 and off of Highway K. There is no rural water, or sewer available to this property but it does sit far outside of the city limits and has no building codes so you can get creative with your sources of power, water, and waste management. Give us a call today to make this property your own.